Check out my new rooster! 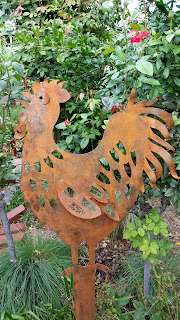 Anna works with metal and creates fantastic art work to adorn the garden; or to hang on a wall inside or outside. She can be found most weekends at the quality craft markets in Adelaide. Anyway, I wanted a rooster, not the usual hen on a pole. She took on the challenge and I gave her feedback on her initial design. In January Anna delivered the rooster and he has has taken up residence in the backyard chilli patch. Life is a long trail with some easy paths and some more challenging. I thought of this when I discovered a mountain trail in China, up Mt. Hua Shan. The trail starts with a gigantic set of stone stairs, called "the Heavenly Stairs." These stairs go so high up the mountainside, it's hard to see where they end. Click on the link for a pictorial view and discover what is at the top. Last night, New Year's Eve, I cooked up a treat. So simple and yet so special. I remembered a meal I had at the Aquacaf restaurant at Goolwa. A thick snapper cutlet served on top of babaghanoush with a side dish of tabouli. It was superb. A slow lunch with a bottle of Sauvignon Blanc; watching the boats on the water. Yesterday I lined up at the fish shop. Surprisingly it wasn't as busy as in past years. Huge amounts of money were changing hands. People were going over-board buying prawns, bugs, crayfish (lobster), ... all the expensive goods. I bought a dozen SA oysters (the best in the world) for $14.99, some smoked ocean trout (to eat later in the week) and a few thick cutlets of Tasmanian Atlantic Salmon (with the skin on). Snapper is a stronger flavoured fish, but I thought the salmon would be more appropriate for a special occasion; and salmon is ideal for serving just slightly under cooked.